The digital adaptation of Onirim is now available! Discover the digital adaptation of Onirim on your phone and tablet for $0.99*! 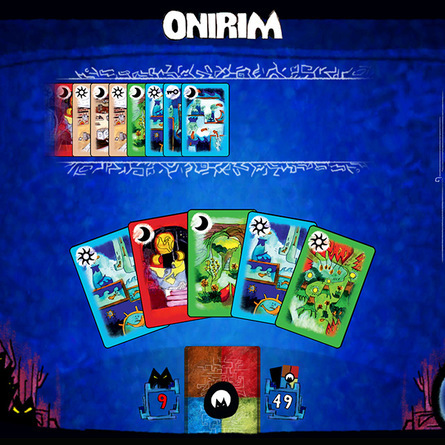 Onirim is a solitaire card game where you play as a Dreamwalker, lost in a mysterious labyrinth, and you must discover the oneiric doors before your dreamtime runs out – or you will remain trapped forever! Will you wander in each room, hoping to find the door that will take you further, or will you let chance sort things out and trust in your luck? In either case, you will have to deal with the slithering Nightmares which haunt the hallways of the labyrinth. Learn more about the game in the trailer on YouTube. *Price is in USD and may vary depending on stores, countries, and/or currencies. This entry was posted on Thursday, April 6th, 2017 at 16:52 and is filed under Asmodee Digital. You can follow any responses to this entry through the RSS 2.0 feed. Both comments and pings are currently closed.